Why is shredding your documents an essential part of your corporate social responsibility? A recent study found that current climate change predictions may have significantly underestimated the speed and seriousness of global warming. New research like this, as well as changes to the political landscape that saw the USA stepping out of the crucial Paris Climate Agreement, have pushed environmental issues to the top of many agendas. As a result, eco concerns have a major role to play in corporate social responsibility (CSR) and many businesses today are prioritising this within CSR policy. There are many ways in which CSR has a key role to play for business today. Consumers expect to see key CSR commitments clearly set out in writing and these are often a foundation component in marketing strategy. Strong CSR, particularly with an environmental focus, has a role to play in recruitment – attracting the best candidates – and the business culture that is created. There are also legal and ethical implications that mean every business should ensure it has a CSR policy in place. The simple function of shredding has a lot to contribute to the brand values and reputation that a business can build. In the UK we produce 200+ million metric tonnes of waste every year and every organisation with CSR in mind should be taking steps to ensure responsible disposal of its own waste, minimising its impact on the environment and on the immediate vicinity. Shredding makes this easier with a system of locked bins that are picked up by an on-site shredding partner and the contents securely shredded and recycled. Energy costs are reduced as shredding takes place on site and documents and media don’t have to be shipped to a facility. Plus, shredded paper is easily recyclable into other items (such as paper), reducing the cost of producing this new and minimising the waste from the business that ends up in a landfill site. Integrating shredding as part of a business’ waste disposal infrastructure shows a clear commitment to reducing waste and taking CSR seriously. Data protection has been a big issue over the past year with the introduction of the GDPR. Issues relating to data security are not entirely separate from CSR – ensuring safe and compliant data disposal is as much about corporate responsibility to the owners of that data as it is avoiding fines for a lack of data protection compliance. Shredding ensures safe destruction of data, no matter how sensitive or confidential it may be. It not only protects the business from being pursued for breaching data protection requirements but also proves that the organisation takes its responsibilities with respect to protecting others’ data seriously. If CSR is a priority for your business then shredding provides a simple and effective way to bolster that commitment. From the positive impact of reducing environmental impact by minimising waste and maximising recycling, to proving data protection is a priority, shredding provides a firm foundation for CSR whatever industry you’re in. 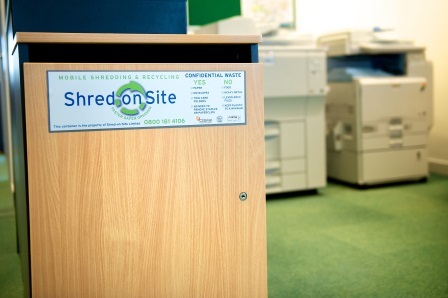 Get in touch with Shred-on-Site today to find out more about our on-site shredding services.